And so let us hearken to the call. Remember that this holy season is not one of gloom and sadness—but it is indeed one of healthy sorrow for sin. Examining our hearts and knowing our sins, considering more carefully our motives behind what we do all day long and what we say, noticing more readily what we fail to do that we could have and should have done… Are these not sensible ways of keeping a sound mind and vigorous soul for God? One of the best ways to assist you in your efforts this Lent is through spiritual reading—useful, edifying, regular reading. A few of our new titles, pictured below, were chosen with this particularly in mind. Other books specifically about the Passion of Our Lord are The Dolorous Passion of Our Lord Jesus Christ, What Jesus Saw From the Cross, and On the Passion of Christ – According to the Four Evangelists. Visit the section of books on the Spiritual Life, where you will find many profound and practical guides for this soul-retreat time, especially Spiritual Combat, Why Must I Suffer – a Book of Light and Consolation, My Imitation of Christ, and numerous others. Reading the Holy Gospels is, of course, an excellent way to spend the time of Lent. A wonderful way to fill with spiritual benefit your time driving to and from work and school, is to download the Audio Gospels, recently released by the Seraphim Company. 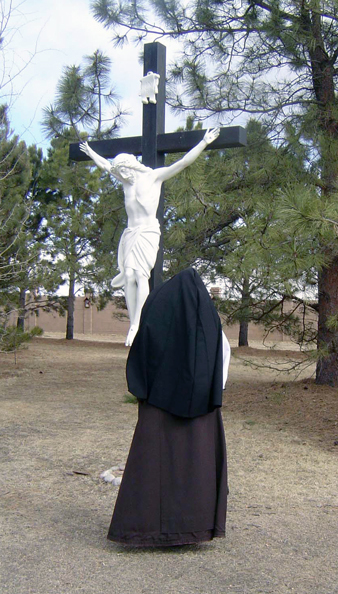 Of course, the long-established Lenten custom of praying the Stations of the Cross offers prayerful meditation, rich in graces for the devout soul. Two different booklets of The Way of the Cross give the beautiful prayers of St. Alphonsus and St. Francis of Assisi. The Stations Crucifixes offer you a way to pray the Stations privately at home. All the Sisters have had colds this winter. But as we understand it, nearly everyone has been sick this winter! But we are all pretty well mended now and ready for the rigors, as well as the joys, of a Carmelite Lent. We have also been working our way through repairing a small mountain of very old vestments. This intricate work is most painstaking, but so very interesting. The clever ingenuity of our expert seamstress Sisters discovers a way to “heal” the vestment for another few years of wear. Sometimes we find beneath the vestment linings notes written by the makers of these vestments, often by communities of nuns. The notes record the date of its completion and where it was made: precious relics of another age—an age of faith and matchless devotion! Recently, we opened the lining of an old chasuble to find the page of a French calendar from the 1890s! “Projects” is a word you read often in these newsletters. 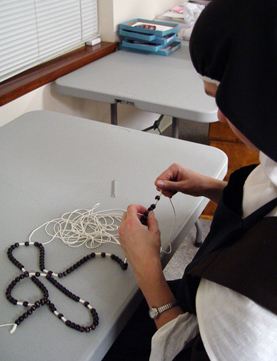 One that has occupied the dedicated interest and time of several of the Sisters is the perfecting of our cord rosaries. They had set themselves to make and provide strong, beautiful cord rosaries, and now they can be found on our website. 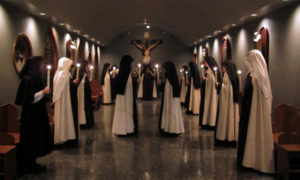 Lastly, we continue to communicate with young ladies regarding the Carmelite vocation. Several will be visiting the monastery in the coming weeks. Please keep in your prayers all of our young novices and aspirants. May your Lent be most fruitful—glorifying our Crucified Master and leading you to His promise of victory and sanctity.